On any other day, this cache would have been ignored by those who do not know of geocaching. . But because it is April 20th, the anniversary of the Columbine High School massacre, suspicious looking packages get more then a second look. On the right is a picture of the cache called “A Knight’s View. (GC1240D) This cache was place with permission of The Boulder County School district on school property. The cache owner is a instructor at Fairview High School. Normally, caches placed near public school grounds would not be approved by the local reviewer, but approval was granted for this particular cache based on the circumstances above. The cache had been at its location for two years without incident. According to a online article in the Boulder Daily Camera, it seems to me that a lack of communication among all parties, from the cache hunter to the school officials to the cache hider, were the main contributor to the events of the day. 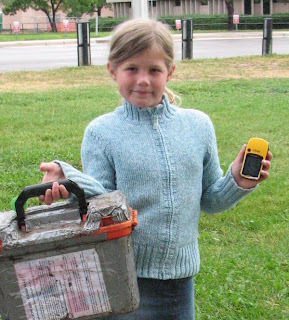 In geocaching, communication with those who do not play the game is critical in insuring safety for all. Because we as cachers feel a need to be elusive when ‘muggles‘ are around, we can cause suspicion as to our intent. We can jeopardize the game by not being honest with others. Link to the Boulder Daily Camera article is here. No this isn’t a post about the very late season winter weather we are having in Denver. This post is about the joys of PC ownership, and the lost weekend of restoring my computer. This computer is the workhorse of the Centennial State Geocaching Podcast. All recording and editing happens on this machine. So any downtime is not good for our product. The symptoms appeared almost all at once a few weeks ago. I lost the SD card reader, fingerprint reader, webcam and touch screen. After a few e-mail exchanges with HP customer support. It was determined that a restore to ‘the original factory settings’ was necessary to determine if there was a hardware failure. I scheduled this past Saturday to perform this task. We were expecting a blizzard over the weekend, so this was a good indoor activity. The restore was going to erase all I had on the computer, so I performed a inventory of the software on the computer, insured that I still had access to the programs, and backed-up the documents folder to our home server. Late in the morning, after a quick prayer, I executed the complete restore option. In short order, I had a ‘brand new computer’ with all the missing functions successfully restored. I spent the remaining day copying back the saved documents and installing most of the software. I shut down the computer that evening, feeling confident that all was well. That was until Sunday afternoon. Upon bootup, the built-in wireless connection failed. After spending most of Sunday in correspondence with HP support (via a wired connection) we got nowhere. The driver to run the build in wireless would not install. I shut it down, defeated. This morning, I stopped in the the Office Depot near the office and purchased a USB wireless adaptor. (Consider it mental health insurance.) Was on sale for $40 US. I just finished installing and now have wireless again. I’m waiting to see if I get any further reply for HP. I expect to have them say I need to restore to original factory settings. If that happens, A executive carpet bomb will be happening.